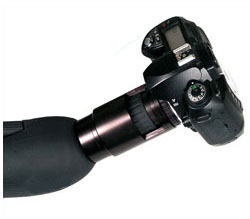 The Olivon standard camera adaptor is a multipurpose digiscoping and standard photo converter. It can be used via a T2 mount to couple to any standard or digital SLR or via filter adaptors direct to the filter thread of digital compact cameras. For Olivon Models: T64, T80 & T90. 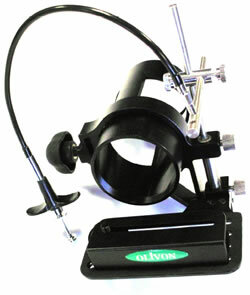 UDCA Digital Camera Adaptor for Olivon telescopes. Purpose designed for the Olivon T64, T80 and T90 telescopes, this adaptor will accommodate most small digital cameras at your eye`s normal viewing position, to enable digi-scoping with your Olivon telescope. The camera can be centred to the 'scope's diopter vertically, laterally, and horizontally. Once set up, the camera can simply be swung away from the eyepiece to allow normal viewing, thereby being ready to re-position in an instant if required for a photograph. The whole adaptor clamps to a guide ring which is pre-mounted on to the thread for the dioptre`s dust cover, (as with the SLR Camera Adaptor), ensuring accurate positioning, whilst leaving the zoom free to move. 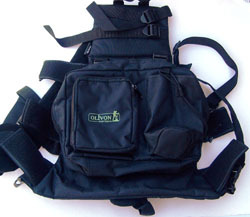 The new U-DCH/C from Olivon is a universal digital camera holder with built in cable release. be operated. The main section can be attached and removed quickly and the camera holder rotated away for fast switching from viewing to photography. At the time of writing, April 2011 the UDCH-C is only available with tube to fit the Olivon T84EDo, T64/80/90 etc and other telescope fittings may available later. 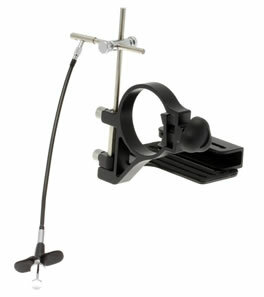 The new U-DCH/C90 from Olivon is a universal digital camera holder with built in cable release. The UDCA-C/G from Olivon is a universal digital camera holder with built in cable release with universal fitting that accepts most digital compact cameras. 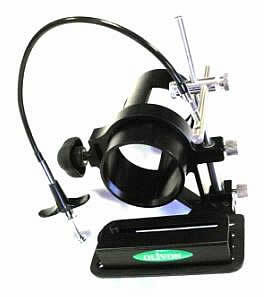 Thi model can be used with other lens tubes and securing rings with many other makes of scopes. it can be attached directly to some wide eyepiece scopes. Coupling is quick and easy. The main section can be attached and removed quickly and the camera holder rotated away for fast switching from viewing to photography. UDCA-C/G could be used without a tube and clamp directly on to an eyepiece of almost any scope. Please note that in order to fit other scopes, as scopes vary in size you should purchase a set of Olivon Rubber Grips (Set Of 3) below. The UDCA-C/90 from Olivon is a universal digital camera holder with built in cable release with universal fitting that accepts most digital compact cameras. Coupling is quick and easy. The included tube attaches securely to the shoulder of the scope - it surrounds the eyepiece and has a cut out section so that the zoom can still be operated. The main section can be attached and removed quickly and the camera holder rotated away for fast switching from viewing to photography. UDCA-C/90 could be used without its tube and clamp directly on to an eyepiece of almost any scope. The UDCA-C/84 from Olivon is a universal digital camera holder with built in cable release with universal fitting that accepts most digital compact cameras. The main section can be attached and removed quickly and the camera holder rotated away for fast switching from viewing to photography. The UDCA/C could be used without its tube and clamp directly on to an eyepiece of almost any scope. High quality cable release with wrap around digital camera holder allows this cable release to be used with almost any compact digital camera even if it does not have a cable release fitting. These self adhesive rubber grips help a firm and steady grip on the collar of your scope when using the UDCH-C/G adapter with none Olivon scopes. 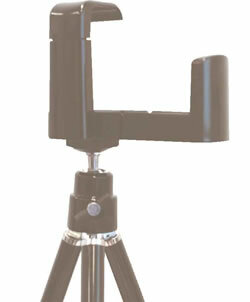 Set up tripod and scope very quickly with the Podtreck still attached to the tripod. Detachable accessory carrier. Detachable waist belt.